In the fast-paced working world in which we live, the worksite is a pragmatic location to teach resiliency building skills that can circumvent the delirious effects of chronic stress. Mindfulness-Based Interventions (MBIs) delivered at the work site are becoming increasingly popular and may be provided by occupational stakeholders in an attempt to sustain a healthy workforce [Shonin et al. (Int J Ment Health Addict 12:806–23, 2014)]. 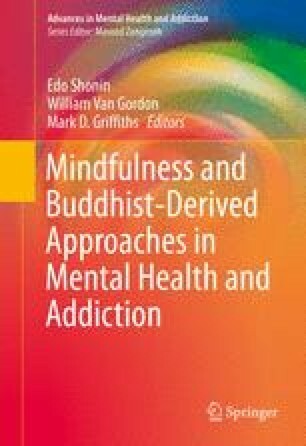 Many of these mindfulness programs have been shown through scientific research, to produce both physiological and psychological benefits across various professions, including nurses, physicians, police, firefighters, teachers, lawyers, etc., with the hope of providing positive strategies to maintain positive mental health. Mindfulness concepts and practice provide value at both the individual and organizational levels. Corporate and academic employers are at the forefront of providing innovative stress reduction through mindfulness programming to employees to curtail the potential of counterproductive addictive behaviors linked to chronic stress. Employee absenteeism and presenteeism are discussed, as well as the potential cost savings for employers choosing to implement such innovative programs.